Color / Drivers: Black, 1 x 12"
Black, 1 x 12" Black, 2 x 12"
This item is not available for purchase online. Please call us at 800.606.6969, or visit our NY Superstorewvqcbfqdvawtxsxtvvv. 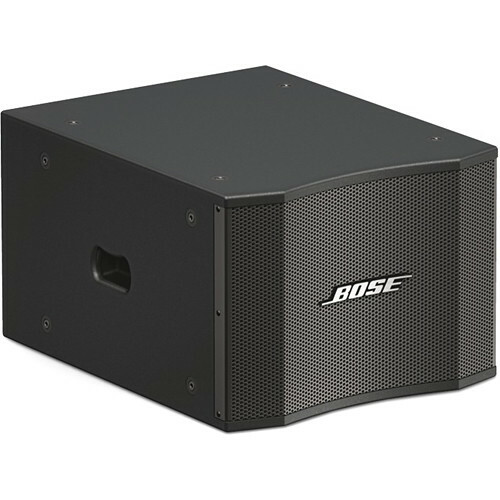 The black, weather resistant MB12 WR from Bose is a modular bass loudspeaker designed to provide bass augmentation for Bose LT arrays and other subwoofer applications. The Baltic birch enclosure features a single 12" high-excursion woofer with a 4" voice-coil and a power handling of 400W RMS (1600W peak). The subwoofer offers a frequency response of 40 to 280 Hz and features a front-loaded transmission line design that provides a peak-free extended low-frequency, reducing port turbulence distortion.